Since January 1st last I have been tweeting (almost) every day some photographs of my trip around the Wild Atlantic Way. I'm pleased to see a lot of people following me, retweeting, and favouriting my tweets. 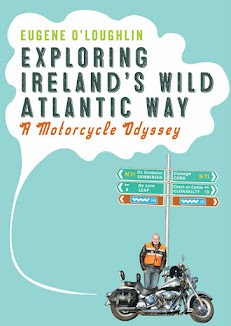 It has meant lots of new followers and makes me optimistic that my new book, "Exploring the Wild Atlantic Way", coming out soon, will sell a few copies. At the moment I am tweeting about one of my favouite places, Achill Island in Co Mayo. A most picturesque place is Keem Bay at the end of the island - below is a photo opportunity with my t-shirt bearing the title of this blog, and Keem beach in the background. Lots more tweets to come!